Taiichi Ohno devotes fully half of his book to chapter 2. Titled “The Application of the Toyota Production System” is one hundred and one pages long and it provides the body of practical knowledge on what we call lean manufacturing today. We will study it not all at once but in manageable chunks. In this article we will cover the first three sections only. Taiichi Ohno was not a writer of books. This book was written by ghost writer Setsuo Mito and was most likely the result of a series of interviews through which Ohno’s ideas were captured on paper. I am sure that the editors did not ask Taiichi Ohno, “If you had only 101 pages to explain the Toyota Production System, what would you say?” but in effect this is what we have in chapter 2. Can You Ask “Why?” Five Times? Ohno begins the chapter begins by challenging the readers if they can you ask ‘why?’ five times? “It is easy to say, hard to do.” He goes on to demonstrate with the classic example of the machine which stops functioning. It overloaded and blew a fuse. The lubrication on the bearing was insufficient. Why was the lubrication insufficient? The volume of lubrication from the pump was insufficient. Why was the pump not pumping enough lubricant? The rotor of the pump is worn and loose. There is no strainer so metal shavings got in. Not to challenge the master, but the reply to the fifth question should be “metal shavings got in the pump” which would have led to a sixth “why did the metal shavings get in?” to which “there was no strainer” would have been the answer. This is a case in point that the “5 why” principle must be followed in spirit and not in letter; often we must ask “why?” many more than five times to complete a thorough investigation of even simple problems. As a matter of fact, we could say that the Toyota Production System came about as a result of the sum of, and as the application of the behavior by Toyota people to scientifically approach matters by asking “why?” five times. He goes on to explain how the systems of jidoka, just in time, heijunka, visual management and kanban all came about as a result of questioning, “Why can’t we..?” have one operator run multiple machines, deliver goods just in time, prevent overproduction and so forth. Ohno makes his point again at the close of the section, that while he certainly values data he values facts that can be found on the gemba (“actual place” or shop floor in case of manufacturing) above all because only these facts can result in effective countermeasures. Improved efficiency is only meaningful when it leads to cost reduction. This requires producing the required amount with the least resource. Efficiency improvement must be looked at not only at the level of individual people, lines staffed by teams of people, and groups of these lines but as efficiency of the entire system. Ohno states that by taking out these wastes fewer people will be needed to do the same work, and that the removal of waste from work is an activity which respects people by making the work more meaningful. He is aware of the criticisms of this approach in that many companies use it to reduce employment. He states that it is the responsibility of management to make good use of the people freed from their jobs through kaizen by bringing in or finding other meaningful and productive work, rather than opportunistically cutting cost through layoffs or by promoting early retirement. If his gemba philosophy were an -ism he would be a gemaist, one who believes in gemba. 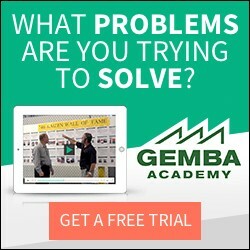 However as an an -ology the gembologist would be one who studies the gemba. I think this is what Taiichi Ohno is saying that he is: a student of the gemba, through and through. That experience of documenting standard work, which is the basic foundation of a production operation, was the beginning of my 35-year journey of developing the Toyota Production System. This was also the starting point of my gembology. Ohno concludes the section by saying that like the andon lamps, the kanban cards attached to a container of goods and other visuals that exist at Toyota or any good company as part of the visual management system enabling gembology, standard work documentation must be visual and easy to understand. Ask why, pursue true efficiency, remove waste, go to the gemba and document the standard method so that the norm becomes visible. This is how Taiichi Ohno defines shop floor management at Toyota. Read article on chapter 1 of the Toyota Production System by Taiichi Ohno. Buy the Toyota Production System in English.